He exaggerated a bit, but . . . The house we moved into in Sandwich in 1976 consisted of a small shack built in the 1920s (judging by the newspapers we found for insulation above the ceiling), onto which in the 1960s a Cape had been built by new owners. They only used the house rarely, in the summer. The Cape was a shell, had never been wired for electricity, and the oil furnace had been drowned in a spring flood; Don wired the house, had a chimney built, and installed a woodstove in the living room to heat the Cape part of the house. The shack, which had become an ell after the addition of the Cape, contained the house’s plumbing, and for heat as well as for cooking there was a big cast-iron range that had been converted to oil from wood. Much of this situation was the inspiration for the trials and tribulations in one of my novels, A Lovely Time Was Had by All. I learned to enjoy cooking on the oil range, and I loved drying mittens on its shelf, but it had plenty of drawbacks, such as the price of the kerosene it used and its habit of freezing up on cold winter nights. Picture valiant Don in bathrobe, parka, and boots, outdoors with a flashlight and a boiling teakettle, thawing the line from the oil barrel to the house! Other houses in our neighborhood had normal kitchen stoves, gas or electric. But three of our neighbors—the Jacksons, Marcia, and Lib—had an updated version of the black iron range, a white enamel gas range that also served as a space heater in their kitchens. The lettering on the stoves said that they were made by Magee. 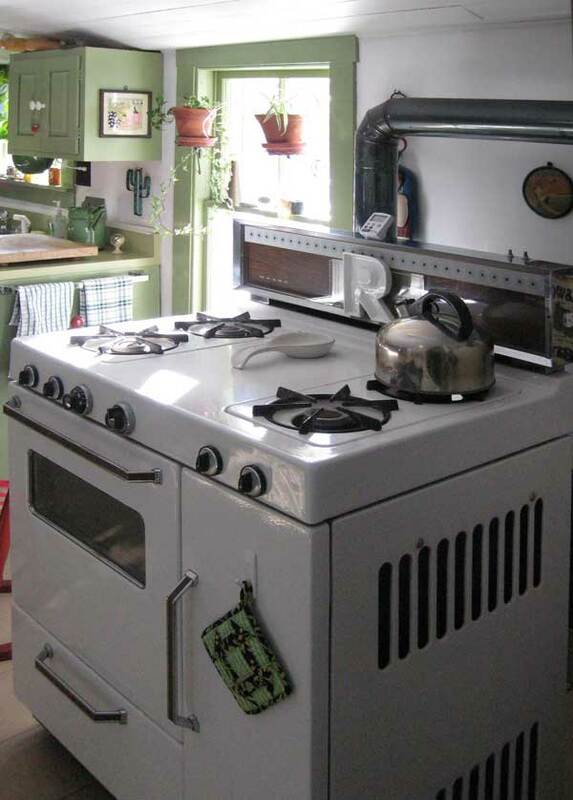 The first time we saw one of these stoves, which happened to be the Jacksons’, we were seized by Magee-stove envy. In 1985 the Jacksons sold their house and moved to a retirement home. The new owners moved in, and we all introduced ourselves. It didn’t occur to us to ask what they were going to do with the Magee, because we assumed they would want to keep such a treasure. Then one day Don happened to notice while driving past that they had lugged the Magee out of the house to the barn as if they were going to get rid of it. He overcame the Yankee diffidence in his soul and swung into their driveway, jumped out of his pickup, and banged on their door to inquire. Yes, they said, they were redoing the kitchen and replacing the stove with a modern one. No, we couldn’t buy it from them; they would give it to us for taking it away and saving them a trip to the dump! So, with help from friends, we loaded it into the pickup and brought it down the road to its new home. Don took it all apart, cleaned every single inch, and reassembled it in the kitchen. We moved the oil range into the dining room, where it remained for several years as a sort of sideboard until we convinced a high-school classmate of mine who was in the antiques business to cart it off; we had got the Magee free, and we passed along the oil range free to him for the lugging. Don likes everything to work. He got the Magee functioning better than it probably ever had in decades, but he could not make its clock go, which bothered him. I was too happy with my “new” stove to care; what the hell, we could buy an oven timer at the hardware store. Don removed the clock, but the blank space bothered him, so he glued up a ceramic R that Penny, my sister, had given me as a reminder of the Mary Tyler Moore Show’s M that Mary put on a wall in her apartment. The Magee was acquiring even more personality. Its oven’s window was so etched with age that even Don’s intense scrubbing with various detergents could not clean it, but I didn’t care about that, either. I was, however, taken aback when I realized that the oven ran fifty degrees hotter than the oven thermometer registered. Then I thought, again, what the hell. My days of tricky cooking were over, I wasn’t baking soufflés and popovers and cakes anymore, so all I had to do was remember to set the oven fifty degrees lower than the recipe wanted and the macaroni and cheese would bake just fine. Of course I forgot at first, but there were no disasters. Over the ensuing years, the Magee has continued to heat the kitchen, the bathroom/laundry room, and the third room in the ell, Don’s little office. When the power goes off during snowstorms, it has kept the ell warm and the plumbing from freezing. Yet it has had its ailments, through which Don and our gas-company repairman have nursed it. Occasionally we think we should look into some more up-to-date method of heating the ell and we investigate, but every other choice leaves us stymied, mainly because most modern gas heaters have to be started by electricity. Catch-22: If the power goes off, the gas heater won’t work. Gradually one worry loomed larger during the years. If we were going to have to keep using the Magee forever, how would we? Where would we find parts? Then a few years ago Lib decided it was time for a convenient new stove. Knowing about our worry, she offered us her Magee. Joy! Don immediately phoned the gas-company repairman, who, with a helper, came to Lib’s house, picked up the stove, drove it to the gas-company place, and took it to pieces, saving everything they thought our Magee might need in the future. These pieces are now stored in our cellar, giving us a secure feeling rather like that given me by, back in my canning days, the jars of soups and pickles on our cellar shelves. Thus we have two of the three neighborhood stoves, one intact, one in pieces. Someday we may make inquiries about that third one, just in case . . .